Here is a resolution: ask your students for a sketch first. Search the Internet for “Barbie Bungee handouts. I have. 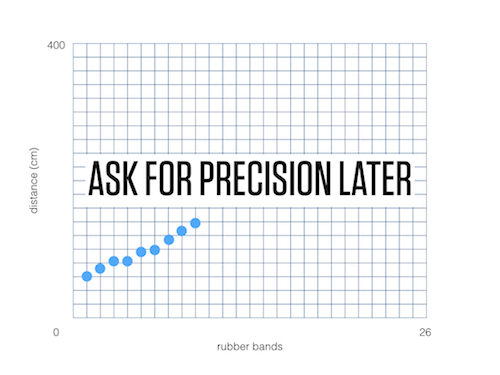 Invariably, the handout asks students to collect data for how far Barbie falls given a number of rubber bands tied around her ankles and then graph the results precisely. Often times those handouts include a blank graph with precise units and labeled axes. Asking students to sketch the graph serves so many useful purposes. It helps us clarify assumptions. What do we mean by “distance”? Barbie’s distance off the ground? The distance Barbie has fallen? Predicting the relationship makes it easier to answer questions about it later. This is from Lisa Kasmer’s research. It’s productive for students to decide if they think the relationship is linear, constant, increasing, decreasing, etc. What is its general shape? How do these quantities covary? 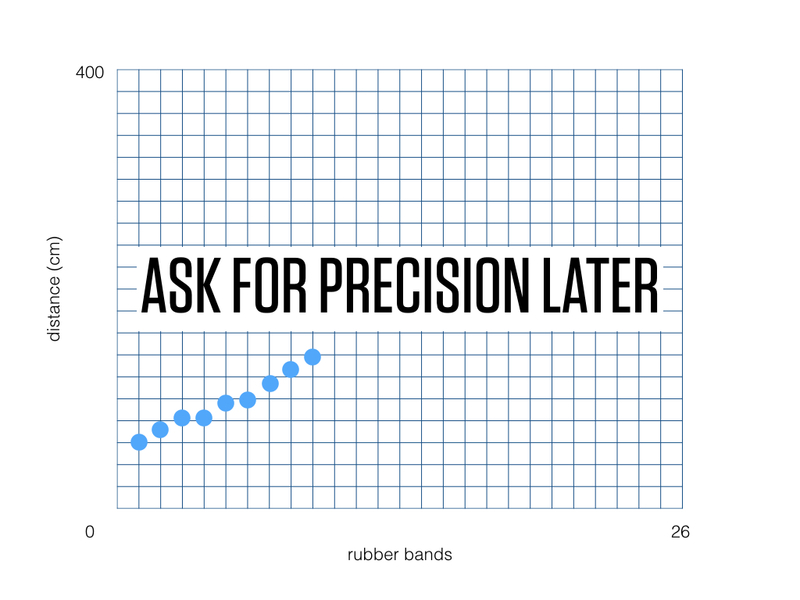 As rubber bands increase, what happens to distance? Later, when students start to graph data precisely, the fact that the shape of their data matches their sketch will help confirm their results. Comparing informal sketches, which may vary widely, will likely make for better debate than comparing precise graphs, which will largely look the same. And controversy generates interest. Which would make for a more interesting classroom debate? These three precise graphs? Or these three imprecise sketches? If the answer is “make a precise graph of a real-world relationship,” then developing the question means asking for a sketch first. That’s my resolution. You will probably also encounter a lot of mix up with dependent and independent variables. Yay! I’ll definitely ask for the sketch first from now on. I’ll probably not provide the labels on the axes though, curious to see what they’d come up with from a raw start. Thanks, Dan. This has echoes of the estimation 180 protocol. Given a prompt (picture, video, Barbie bungee jumping) come up with an estimate. Kids who are familiar with this routine will not be surprised that their teacher is asking them to think this way. It transfers to many problem solving experiences and provides some coherence. Here the sketch is acting as the estimate. So after asking the question (“What do you think the relationship looks like between the number of rubber bands and Barbie’s distance?) what would happen if you added the “give me an answer you know is wrong” part? How easy/hard would it be for the kids to come up with a graph that is clearly wrong and justify why it’s wrong? That could also be enlightening, and could generate good discussion, especially if one kid’s “clearly wrong” graph is another kid’s estimate graph. I’ve tried this in math & science classes and students’ response is usually to ask what I mean by “sketch”. 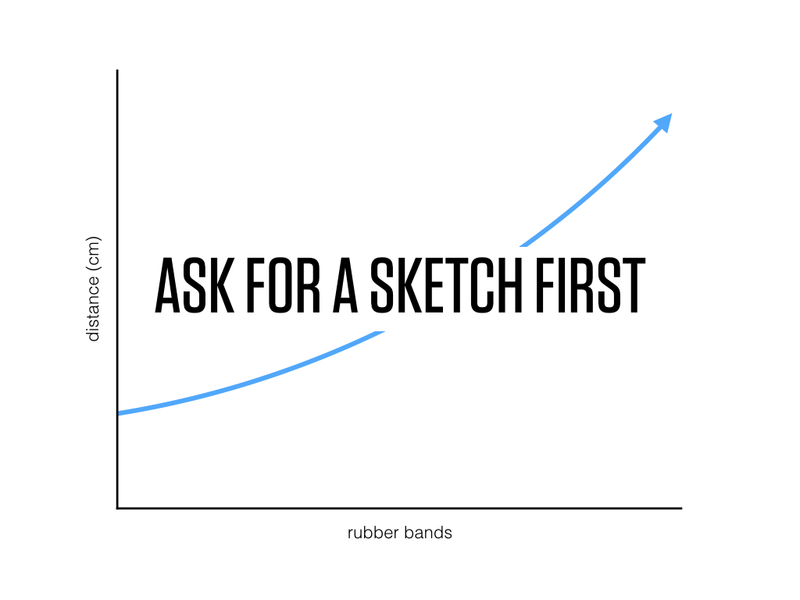 To many of them “sketch” and “draw a very carefully labeled graph” mean the same thing. What’s a quick one-line definition of “sketch” that would have them doing what we want (the kind of graphs you have in the post)? Pending the class – we could also start asking for them to indicate a scale too, not needing to label individual points, but offer some sense of scale. This is a concluding activity in all of my grade 7 classes. Candy bars to the team with the closest surviving jump. For some of the classes, I give them too much detail in how to generate the data. Asking them to sketch would get them to think more about what the relationship is, what are the related variables, what would it look like. Well, that’s the hope. There is always confusion about independent/dependent variables. I think this falls right in line with making your “Best Guess” when doing 3 act math tasks. Getting students to put themselves out there and not feel bad about their initial thoughts can take some time, but worth it in the end. Fawn – I agree with you re: having students identify variables & placement on each axis. A lot of great discussion can come from this. Sorry if I’m missing something here, and I have no idea why I’m typing this so late (or early in the morning). Maybe I need to take one step back before moving forward with this post? Are we asking students to sketch a graph BEFORE they even collect data? I need to know WHEN you’re thinking of asking kids to sketch the graph. I need to know when students agree that a graph is necessary here. Dan, I feel your question, “What do you think the relationship looks like between the number of rubber bands and Barbie’s distance? Sketch it.” only matters once the students have agreed that a graph will help them here. Aren’t we eliminating the art of modeling with mathematics by giving students a blank (maybe labeled) graph on the handout? I say we don’t even include the graph anywhere, AT ALL! Only once students (or the class) agree a graph is a helpful tool will developing your question matter to me as a teacher. Some students might just be happy collecting data in a table and work with that info to predict the number of rubber bands. I’ve seen that both work and fail too. If you want kids to sketch what’s happening, maybe have them sketch a series of three(?) drops and I’m not referring to a graph with a horizontal and vertical axis. I’m referring to kids actually drawing stick-figure dolls, a horizontal bridge line, and the rubber band line. I’m all about students making guesses, estimating, drawing sketches pictures. Therefore, if this task starts with kids making an initial guess (or estimate), I would develop my question from this point. I’d want my students to sketch two pictures for EACH drop. Picture one would include Barbie descending to a point in the air where the rubber band line is straight from the bridge to her feet, but the rubber bands have NOT been stretched. Picture two would be the same drop, but Barbie’s rubber band line HAS been completely stretched out. Hopefully some of that made sense. So I believe Dan was trying to back things up a bit and eliminate the possibility that students would be more concerned about individual data points and more about the actual relationship as a whole. @Andrew, Kyle has me pretty well, I think. Assuming that at some point the teacher wants the student to make a precise graph, then making an imprecise graph is a useful preceding activity. It seems like you’re making a different assumption, that the teacher wants the student to make any representation. Yes, I totally agree that making an imprecise graph is a useful preceding activity when the teacher wants a graph. I think I needed clarification in the sequence of things. I’m really pushing and stretching myself to give students less at the onset of tasks as to allow them to dig deep into their tool belt to see how they can best represent the scenario. I wouldn’t mind if I, the teacher, asked the students to make any representation in the early stages of the task. I think it would be quite organic for a table and graph to arise from student/class discussions and that would catapult me into asking them for an imprecise (estimated) graph. These blog posts have been extremely valuable in helping me reflect on how I’ve done this task in the past and how I’d like to experiment in the future. I appreciate it. Developing The Question: Ask For A Sketch First, Ctd. Developing The Question: Needs Improvement!